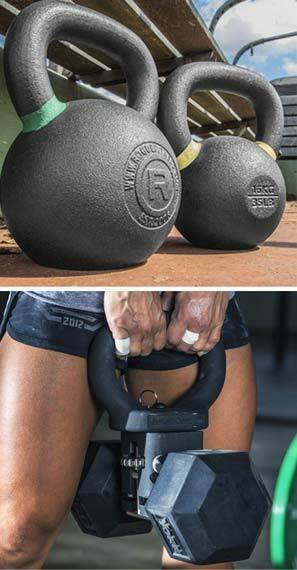 Kettlebells are a great thing to add to your home gym. The Kettlebell swing works all the muscles from the base of your skull to your Achilles tendons. Best of all it will help you get the perfect rump. There are 2 types pictured to the left. First we have the The Rogue Kettlebell which is made from premium material: the highest quality first run iron ore available, not scrap. It is cast in one solid piece, creating a stronger, more reliable handle and a void free surface. The Rogue Kettlebell does not use plastic caps, plugs, or patches like lower quality products. Second we have the KettleClamp. It will turn any Dumbbell into a Kettlebell. No matter if you have been newly introduced to kettlebells through CrossFit, or are an RKC certified instructor, the KettleClamp offers an uncompromised kettlebell experience. The KettleClamp makes kettlebells accessible to virtually anyone by turning ANY dumbbell into a kettlebell. The KettleClamp was created using state of the art design & manufacturing technology. To ensure an authentic feel, the KettleClamp is constructed entirely from cast aluminum and stainless steel. The KettleClamp is a strong, fast, safe, and durable adjustable kettlebell that fits into your gym bag and budget. Are you concerned about staying healthy and slim? Are you packing on pounds and you do not know why? Studies have shown that dieters who keep a food diary (also known as a food journal) are more likely to meet their weight loss goals then people who don’t. This is because keeping track of everything that you eat can help you notice when you might be mindlessly snacking. Sometimes a doctor, such as an M.D. or a psychiatrist will ask you to keep a food diary so that they find out if anything that you are eating is triggering obesity. The same goes for certain types of fitness instructors, dieticians and nutritional counselors. In your food diary you should include what you ate, what time you ate the food and where. Write down whether or not it was consumed in a restaurant, at home, or in your car. You also need to notate whether you were eating alone, with friends or sitting down at a family meal. Don’t forget to include everything that was included in the meal or snack. Don’t forget to include things such as salad dressing, butter, sour cream mayonnaises, sauces and gravies. You should also describe what sort of mood you were in while you were eating. Were you feeling sad, happy or depressed or was it simply time to have a meal? It also helps keep track of your water intake. You should be drinking eight glasses of water a day. Do not include tea, soft drinks or any other types of beverages as part of this accounting. Give yourself a pat on the back if you somehow manage to drink more than eight hours of water a day. There are certain tricks to keeping a food diary successfully. For instance make sure that you carry your food journal with you wherever you go. Don’t depend on your memory to recall information about what you ate. The memory of a dieter tends to be very selective. Make sure you record what you are consuming as you go and you will be more mindful of what goes in your body.